These countries are leading the charge to clean energy | Watts Up With That? 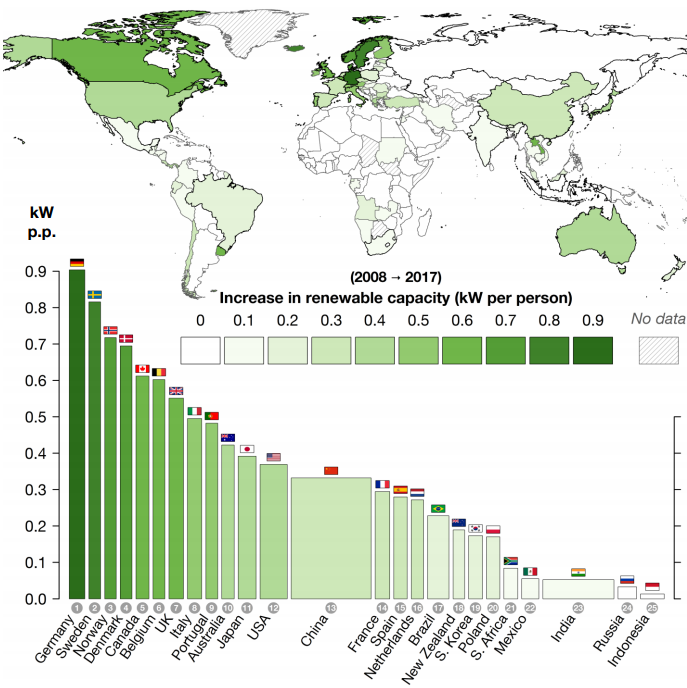 Some countries have been more effective than others in their green energy policies. March 24, 2019 in Energy. Listing wind and solar by their nameplate ratings is purposefully deceptive. As does ignoring multiple countries massive expansions of coal and LPG generating capability. One suspects that they’re also using some country’s nuclear generating facility expansions as buttressing their alleged renewable expansions. It’s all lies and propaganda. China and the United States (6,500 TWh and 4,250 TWh respectively) also reduced their carbon intensities in 2017. Indeed, if they could both match the reductions made by the UK, global emissions would fall by 9%. If China and the US shut down all their coal mines, their steel and aluminium industries and converted their entire economic model to fraudulent banking , there would be NO world economy. No problem. Obviously the way to go. there would be NO world economy. And does Norway (for example) import electricity from neighbouring countries, and is any of it generated from fossil fuel or nuclear stations? I believe that Norway takes electricity from Denmark – very cheaply – when their windmills produce more than they need. Norway, where I live, produces all El from hydroelectric (plus a few windmills) and is using it to push El-cars, power the offshore industry and keep the general population warm and comfortable in the long cold winters! They have also sold lots of green certificates to other countries, who pretend to use green Norwegian power, and are in the process of building 2 huge pairs of power cables to Germany and the UK. When these are finished the intention is for Norway to act as the Green Battery for Europe (but thete are serious questions about whether there is anything like enough hydroelectric production capacity to do that). The real consequencies will be increased power bills for Norwegian consumers as they have to noth pay for the infrastructure and will suffer as Norways cheap El becomes more expensive European electricity! Just an aside, Børge Brende who is MD of the WEF used to be the Environment Minister in Norway, before he moved on to bigger and better things, and is rumoured to be the man who nominated Al Gore and the IPCC for the Nobel Peace prize! CAGW looks like a new religion for white people. Very much so. I was howled down in a variety of outlets for suggesting that the opposition to the Adani mine in Australia was a wonderful example of neo-colonialism, with privileged white folks telling brown people how to live. Must have struck a seriously exposed nerve! Exactly! The entire néomarxiste putsch with its duplicitous window dressing of ‘diversity’, saving the planet, ‘safe places’ from non PC speech and everything else that conceals the hard left plan of global gov poli-econ control is a ‘white’ neocolonial construct. Other races actually don’t go for this, having earned a cynical attitude about former colonial powers intentions long ago. But, hey, let’s go along with it to see if they are really going to dole out all this cash. Yeah, I thought so! Africa and Asia are building coal-fired electricity plants and getting on with their development. Eastern Europeans of course recognize the real plan behind it all and they aren’t buying. The graph showing who is buying in to the CO2 nonsense is more like an upside down graph of progress toward a new Dark Ages. Trust the US to be an oulier! Their apparent climate virtue is really the result of a a huge introduction of natural gas into the mix. Germany didn’t fail to notice and with the new natural gas pipeline, their ’emissions’ will go down and their economy up. Britain should be ashamed of itself. All the Western democracies are drinking the KoolAide. Driving as fast as they can down a deadend road. They are going to bankrupt themselves running from a fake danger. The machinations of the Trudeau Jr. cabinet are being exposed. What we’re seeing is airy fairy on the surface and deeply compromised beneath the surface. I have hope that they will keep that up and not do something stupid. Trudeau’s problem is that some of his inexperienced cabinet members thought they should be actually doing the airy fairy stuff. The links to the maps all point to drax.com so it is no wonder that the UK appears to be a leader of the pack. If you don’t count the CO2 emitted by burning wood, it’s easy to be a world leader. Deforesting North America to feed Drax is hardly my idea of being eco- friendly. It would be instructive to show a chart of the change in electricity prices per country over the given period and the change in number of black-outs per country over the the given period. I’ll wager there to be a strong correlation. 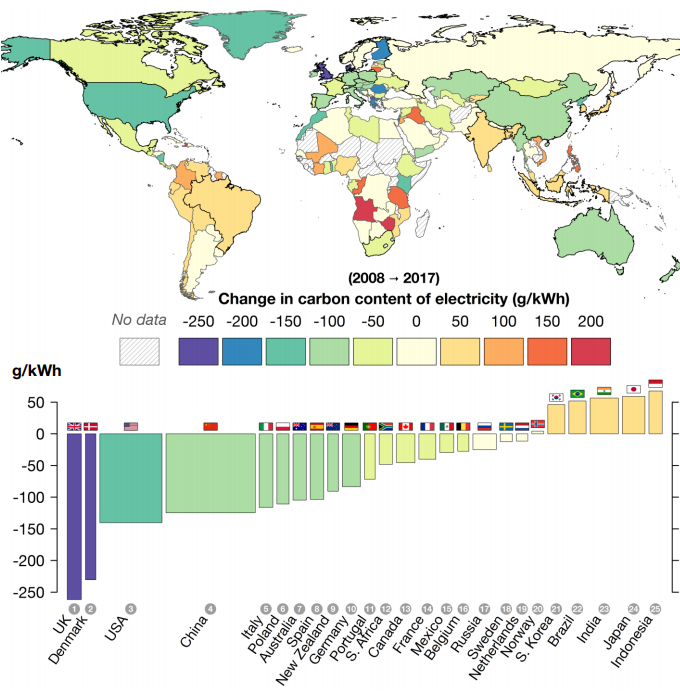 Also interesting that they confessed that even if all countries undermined their electricity generation with unreliables as strongly as the UK, then the world’s thin air emissions would fall by a paltry 9%. If that ‘underpins almost all efforts to shift to a decarbonized (sic) future’ it shows how futile the squander on unreliables really is. It would also be instructive to track the levels of unemployment as well. Nothing to do with employment levels. I’m in the UK. My energy bills seem to have roughly doubled in the last 5 years or so. Blackouts are almost unheard of and, to my knowledge, down to local failures, not grid failures. However, at the rate we are going, I suspect it’s only a matter of time. High energy costs? Nothing to see here folks…move along. It must be called the World Economic Forum because it isn’t. And dis-economy is waste. Good point. All the countries led by despots add “Democratic” to their countries names as do political parties that feel they need to advertise it. Protesteth to much? Its like institutions and ministries that add to their “Renoubles” appellation “and Economic Prosperity”. Some countries need more batteries? Should be renamed The World Economic Collapse Forum. It’s good to see that large parts of the World are ignoring ‘Global Warming/Climate Change’ hysteria or simply paying it lip service. The graph could double as a measure of the spread of Global insanity. That’s probably the biggest takeaway from this article. How much of this report was written by a 16-years old brat? 16 in terms of the number of years lived or 16 in terms of understanding and accepting reality? Says you. They can’t even give us a number for the ECS, but they know just what is required to control the Earth’s temperature. They are so certain about uncertain things. China is leading the charge to a cleaner energy??? Says who? How do these propagandists look themselves in a mirror the next day? They are thick skinned. And, it is lies as usual. Surely you don’t doubt the accuracy of Beijing’s statistics, or suggest that there could be any falsification of the actual emissions, Robert? Their statisticians are so efficient that they have already compiled the numbers for actual emissions in 2021. Well, if you ask people who want to paint ‘green energy revolution’ doable, easy and to shame Western countries for not being progressive enough, these people tend to find statistics to show that. That China actually every year uses more and more coal (and tops EU + US together) doesn’t fit to this image so well, but the good thing in statistics is that there are so many to choose from so you often can come up with whatever alternative truth you want. 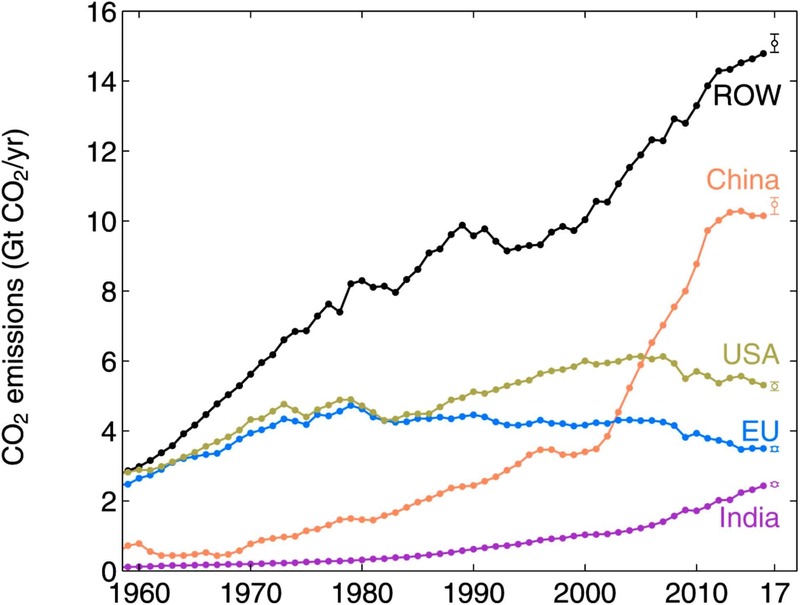 So why would you think the chart ‘carbon footprint’ ends in 2004? It appears as this is not the most important question of our time, chart updated with 14 years old data! Not an effing activist has updated the emissions of China there for the last 14 years! We see it here. It is not an issue! Of course this is fra-dulent nonsense, less than 1% of GLOBAL TOTAL energy is generated from solar and wind. See IEA graphs and links to Lomborg’s latest findings. BTW Australia’s population in 1990 was 17 M and today is 25.1 M or an increase of about 47% in just 30 years. Wake up. And none of this stupidity will make the slightest change to weather or climate for thousands of years. See Royal Society & Nas report question 20 Q&A. Just read the latest 2019 EIA report here on WUWT to understand their nonsense. And you believed the Chinese statistics? Oh crap. My country is a leading country in that aspect. That’s one reason why we are at the bottom when it comes to prosperity in EU. Spot on. All they have to do is use 2017 as the baseline. Isn’t stats wonderful? They want to burn less coal but then they want wide use of plug in hybrid cars, which are really coal powered, oh but we need more wind turbines and PV panels, which take lots of coal and oil and rare earths to make, all of which takes coal and oil to produce. It seems the world is starting to hit the brakes on “renewables” due to the pretzel logic required. What about the other forms of energy, besides electricity? What about what powers planes and trains and boats and trucks that transport the goods and personnel of civilization? Somehow leaving out this [clear throat] “little” detail would make a false rosier-looking picture, even if the maps were anywhere near truthful. In other words, if we consider TOTAL energy, then the reality of [clear throat again] “clean” energy reveals itself as the joke that it currently is to people who live in reality. Keep the renewables: sun and wind. Recycle the gray technologies, the green blight: photovoltaic and wind turbine farms. Save the birds, butterflies, and endangered species. Not one eagle, not one monarch, should be sacrificed for the naive deal. The good news is green energy doesn’t emit carbon dioxide. The bad news is nobody but the super elite will be able to afford it. Here’s the TOTAL World energy generation from the IEA 2015. Note S&Wind + GEO just 1.5%. Here’s Lomborg’s message using the IEA data. S&W 0.8% of TOTAL energy in 2018 and PERHAPS 3.6% by 2040. IOW sweet bugger all and no measurable change to temp or climate at all, by 2040 or 2100. OH and a complete ONGOING waste of TRILLIONS $ for a guaranteed ZERO return. Meanwhile China and India etc are laughing all the way to their banks. Will we ever wake up? What is renewable energy? It depends on your time perspective. Solar is renewable with 24 hour cycle, hydropower with annually, dendro for 20 to 30 years. Well if your time perspective is several million years coal is renewable energy and in fact it is still being made in nature. Leading the charge into oblivion. I must have missed the cost section. Where is that? No sarc needed, it is what she said. I am counting the minutes until the Point of No Return. After that we’re doomed, so there’s really no reason to keep harping about it, is there? I’m sorry Jon, as usually, after the 12 years we will have another 12 years, but the panic will be about the same. I do hope though that since the earliest TV panic piece mentioning CAGW I can track was in 1984, when “American scientists said CO2 will raise seas by two meters by 2100′, and that ‘nothing can be done to prevent this’, by 2040 we actually believe not much can be done, but that two meters is not an end of world + doesn’t even necessarily happen. At least the IPCC gives us that hope, if some politicians don’t. But what I’m to say, 35 years passed with pretty much improving human living conditions is not proof of future results. It was ‘American scientists’, so they should know, right. By 2000, already so bad things happened and by 2020, we will have been all doomed. I guess by 2030, there will be ‘hundreds of millions of climate refugees’ again, and ‘drought and floods’ and yada yada. Reminds me of the Soviet 5 year plans. Never right, but always mandatory. Surely we in the US can do better. We need to burn more coal, and get our economy thriving so that our CO2 emissions increase, to make up for the countries who are cutting back on CO2 emissions and ruining their economies. Increased CO2 – it doesn’t get any greener than that. Besides, someone has to be the adult in the room. Please, stop pushing your vaporware solutions to a non-problem. You have crossed into “tedious poster” territory. Such a study is unfair to France and Sweden which built out their nuclear power generation fleet several decades ago. When you start off with a zinger like that, there’s really no point in reading further, unless you like bad fiction. Yeah, I thought we hit the tipping point in 1997. And 3 and 4 and 5 . . . .
Well, here’s the deal. 1997 was an interim ‘tipping point’, followed by its recurrence several times since and going forward, so they don’t threaten to become bothersome tripping points instead as the dates arrive. Similarly I’m sure you can see, when the temperatures don’t really soar as predicted, the goal posts can also be sequentially re-sited down the road a piece; and at the same time the absent crisis levels of ‘global warming’ are conveniently replaced by a more vaguely accountable ‘climate change’ designation which likewise shifts any troubling assessment down the road. Now if that’s not too clever by half, they call ‘renewable’ and ‘sustainable’ what is now and then generating electricity while beneath a superficial glance it took oodles of fossil fuels and internal combustion vehicles to mine/smelt/emplace (often remotely)/wire up to the users/maintain/and replace at their useful life end. But I suppose wooden electric cars, trains, and planes will soon be pretty much fossil fuel free, much like my sailboat once I replace its fiberglass hull with wood, its dacron sails with canvas, and its dock lines and running rigging with sisal, cotton, and flax cordage. Also I couldn’t help notice that DRAX (which burns wood for sourcing steam energy for its electric generation) left out the whole wood/coal fired steam driven era of the early industrial revolution, their ready amnesia for English native sons Thomas Newcomen and James Watt I suppose leaves them feeling like innovators now. 1997 was a tipping point for tipping points. Prior to 1997, tipping points were few and far between. After 1997 there are tipping points as far as the eye can see, and more being created all the time. The idiots do not include the energy cost to build their scams and the reduction in electrical grid efficiency which is around 10% to handle on/off/on/off wind and sun gathering. If they did there would be almost no real reduction in CO2 emissions. Wind farms require new power lines and new power switching equipment all of which must be sized for maximum output even though average output is less than 20%. The on/off/on operation forced Germany to stop using combined cycle gas plants that are 20% more efficient to single pass natural gas plants as they use the waste heat from the first pass turbines to produce steam. The problem is combined cycle natural gas plants require 10 hours to start and hence must be left on,. The problem with the “renewable” power sources of wind and solar is their intrinsic volatility coupled with their poor capacity utilization rates of only 17.4% for wind and 8.3% for solar (average values for Germany). 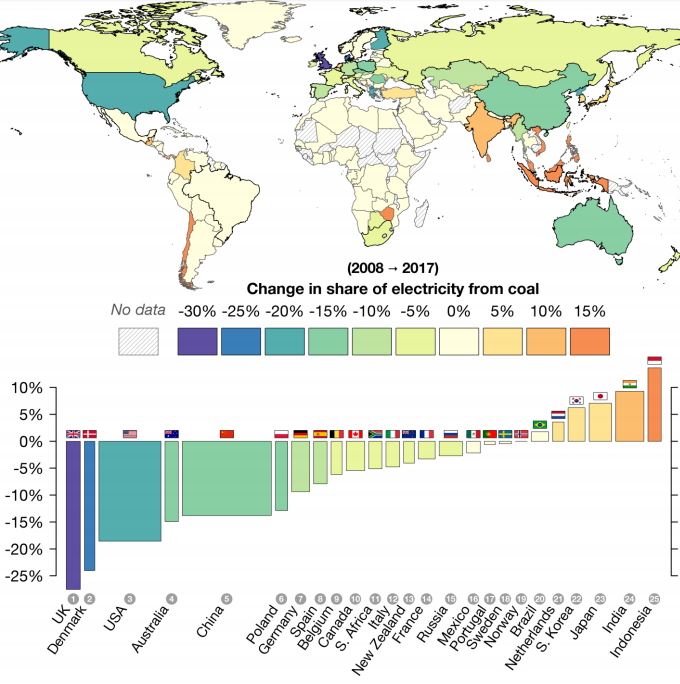 Most of the significant reductions in CO2 emissions worldwide have come from the economic displacement of coal by natural gas for electricity generation. vThe impact of solar and wind has not been significant. Renewables? They can’t even, over their lifetimes, harvest enough energy to create replacements, much less provide a substantial excess for society in general. Re the UK, its only 4 days to go, then they will soon find that Green things are just too expensive for their new way of life. I can see a replay of the TV series “The Guardians” where the Police and military combined to run the country. I would think that what Europe does is largely irrelevant and will continue to export energy-intensive industries to developing nations who will choose the cheapest, however much ear ache they get from enviro brigaders. Thus the nations of China, India, Indonesia, Brazil, etc will gladly take more European industry while their economies also grow organically and while they become more assertive. They don’t intend to do anything very much to eliminate coal use, so the global warmers are going to have to carry on dreaming about the death of coal. If the UN or anyone else thinks these nations will be strong-armed into taking serious CO2-abatement measures then they are overestimating their own skills which are no match for the power of corruption. The UN doesn’t want to even try fixing corruption, for very obvious reasons. Articles like this one from the World Economic Forum[*] banging the green drum probably makes someone feel good but is essentially just whistling in the wind as far as eliminating coal is concerned. The less trumpeted achievements will be continuation of subsidy for wind and solar by governments as nuclear sits waiting in the wings. On top of all that, the nation called Concrete probably won’t be going away anytime soon either. b) deciding how to coerce the world to swallow their unpleasant fix. In the Netherlands the switch is from gas to electricy supposedly powered by “green” energy sources, so they tell us. That means, no more practical gas stoves. The change will be mandatory and the costs, along with food and everything else, will go up and up. Three hundred and thirty thousand indigenous Dutch have already emigrated. Meanwhile, idiots go around in electric cars which overall cause a greater carbon footprint. And the 5G and 6G smart prison is on its way. It’s all going to be all right. The Synod of the Church of England is disinvesting in fossil fuels in order to fight the electrification of the poor of the world. I wonder what Jesus would say? Charles, you forgot the SARC tag. Apparently they have never heard of hydropower, which was very much part of the Industrial Revolution in those countries lucky enough to have suitable rivers. Well the first mistake is saying that it’s green and clean. That’s far from the truth as it’s an environmental disaster in the waiting. SOLAR PANNEL WASTE 300 TIMES MORE TOXIC THAN NUCLEAR WASTE!!! Solar and wind power are the key elements of ‘renewable power’ but both are fraught with economic and environmental problems that are seldom discussed, especially by the technocrats who are pushing them. Solar panels contain toxic metals like lead, which can damage the nervous system, as well as chromium and cadmium, known carcinogens. All three are known to leach out of existing e-waste dumps into drinking water supplies. Which is 300 TIMES MORE TOXIC then nuclear waste. I wonder how many of you know the down side. Though 100% recycling may be almost achievable in rich, industrial countries, Welt cites the experts who say there is the high likelihood the modules simply will end up littering the landscape in poor countries. Poor countries, often located in sunny equatorial regions, face the potential of being blanketed by vast swaths of hazardous material. The researchers say that currently there are about 3700 square kilometers of solar modules installed globally and estimate that as of 2016 the modules contained 11,000 tons of lead and 800 tons of cadmium, reports Welt, citing the study. Welt adds that the EU banned the use of toxic heavy metals and solder by the electrical industry, but the solar industry was exempted on the behest of the solar lobby. The solar industry needs to be included in the ban as well, the experts say. so that the global spread of heavy toxic metals can be curbed. Then we have windturbine waste to deal with???? South Africa reduces it’s emissions by planned black-outs, often of three slots of two and a half hours each. This gas an extra benefit of driving many smaller firms out of business – a textbook example of positive feedback resulting in the collapse of the electricity producer in the shorter term and a merger with Venezuela in the longer term. For PR reasons, a black-out is referred to as “load shedding”. From what I have read, a significant fraction of the “decarbonization” occurring in the EU is due to so much manufacturing being relocated to second world countries. Does the name ‘Wile E. Coyote’ mean anything to these people? germany wanted to go public with its “eco-friendly” railroad and has therefore laid off a lot of staff. Lenghthmen; gangers; patrolmen are missing. As a result, the “environmentally friendly” German railway becomes the target of terrorist attacks. A sycophantic doyen of the UN and quintessential exponent of virtue signalling, New Zealand generates some 60% of its electricity from hydro, essentially all domestic consumption. Since 2006 the consumer price index advises that a basket of groceries costs 35% more. The cost of electricity has doubled. The hydro scheme and dams were built by the government with tax payer money. How long will unthinking people continue to allow themselves to be stolen out of house and home? The know and understand the Green Death. They never knew or understood the Black Death.